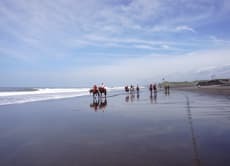 With more than 50 years in the horse business our aim is to give you the unique experience of seeing "the Real Bali" from the back of one of our happy horses. We are a small stable where personal service and your safety and enjoyment are our main aim. We will select one of our horses to suit your riding ability and give basic instruction before setting out. Our experienced grooms will take you out through the lush green rice fields of Pererenan where little has changed in the method of farming for centuries. For those who want just a short, one hour ride, on leaving the padi fields we return through the local villages with their temples and shrines giving a unique glimpse of village life as it still continues today. Great scenery tour, professional guides, sweet horses. I really recommend tbis tour! Had a great time with all the horses, walking along the padi fields before reaching a beautiful black sand beach, which was not crowded and had a lovely breeze. This was the first time all of us went horse-riding and we all enjoyed it very much. The host takes very good care of the horses as well treating them to a nice bath after their long walk and playing in the beach.